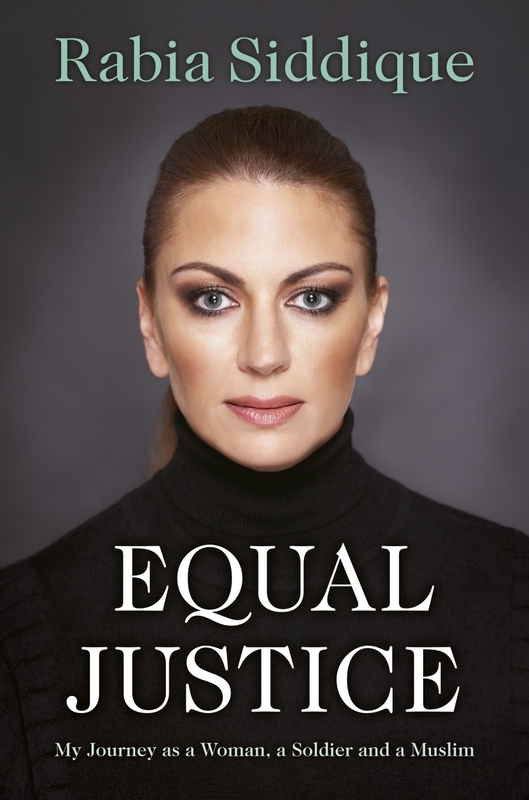 The cover of Rabia Siddique’s biography, Equal Justice. Rabia Siddique’s story is unique, stunning, sad, brave and compelling simultaneously. In her 2013 book, Equal Justice, Siddique chronicles her “journey as a woman, a soldier and a Muslim”, roles that intertwined and added enormous complications to her young life. The daughter of an Indian Muslim father and a white Australian mother, Siddique was born in Perth but spent her infant years in Bombay before returning to Perth at age five to start school in an unfamiliar environment. Her book begins with a flashback to a violent incident that sparked a three-year quest for equality which led the military lawyer to her taking her employer, the British Army, to court in what would become a high-profile workplace discrimination case in the UK. But Siddique first takes us back to the times when she struggled at primary school amid taunts about her appearance until her parents moved her to a private girls school, where she blossomed both as a young woman and a scholar, going on to university to study arts and eventually law. However, the seeds of a lifelong quest for justice and independence were in part sown by traumatic incidents in her childhood and, as she began her university studies, Siddique found the tensions between her and her father grew increasingly insurmountable as she entered young adulthood. When her mother stood by her husband, their relationships were strained to breaking point. Siddique tells frankly how she, unwisely, rushed into a marriage with a good man and a new life overseas – largely, she readily acknowledges, as a way to escape the oppressive constraints being put on her by her father. But that marriage was doomed from the outset, unlike her second, years later, which instead brought her great joy and badly needed emotional support. However, the bulk of this book tells the story about how a young Muslim woman from Perth ended up working in the British Army, negotiating the 2005 release of captured SAS operatives from a police compound in the troubled southern Iraqi city of Basra only to be taken hostage herself. It also explains the careful research Siddique had previously been doing with the local population in order to bring lawless, murderous rogue police personnel to justice. And it pulls no punches when describing the ambush she faced with another senior army officer when negotiating the captives’ release nor when looking back over the subsequent period of surprisingly dismissive and unfair silence from her superiors. In Equal Justice, Siddique deals not only with religious, racial and gender tensions that confronted her in her military role, but also with the galling discrimination meted out to her by the British Army and her battle to have her contributions properly acknowledged. Her well-written story transcends many boundaries and ends on a somewhat unexpected note. Indeed, Siddique’s memoir is, as her book jacket claims, “a story of grit, courage and conviction born out of a unique perspective”.